MILWAUKEE — Jabari Parker returns to Milwaukee on Friday night when the Chicago Bulls take on the Bucks in a nationally televised contest on ESPN. Parker began the season coming off coach Fred Hoiberg’s bench moved into the starting lineup for an Oct. 31 game against the Nuggets in place Chandler Hutchison. He’s been a starter since and comes to Milwaukee averaging 14.9 points on 43.8 percent shooting with 6.7 rebounds and 2.0 assists over his last seven games. The numbers are good, but they haven’t done much to change the Bulls’ fortunes. Chicago brings a 4-11 record into its first meeting this season with the Bucks, who lead the Central Division with a 10-4 mark. Parker’s former teammates will be looking to bounce back after a 116-113 loss to Memphis on Wednesday. The league’s top-scoring team coming into the game was held to 19 points in the opening quarter and shot 34.1 percent in the first half — including a 4-for-23 showing from beyond the arc. 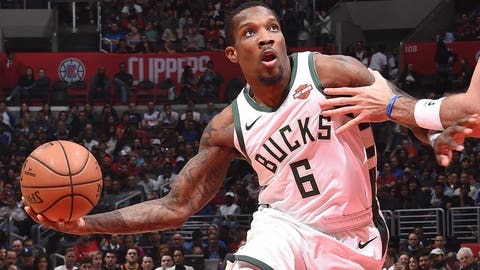 The Bucks rallied and took an eight-point lead early in the fourth before fading down the stretch in their first home loss of the season. “I think we could’ve played with more energy, and could have done better executing,” Bucks coach Mike Budenholzer said. It was just the latest uneven performance for a team that’s been spinning its wheels after a red-hot start to the season. Milwaukee won it’s first seven games in impressive fashion but has alternated losses and victories since, which has left Budenholzer admittedly puzzled. The Bucks are in good position to turn things around against Chicago, a team they’ve beaten in each of the last two meetings, but also as they play the second contest of a season-long six game homestand.